So, I’m actually feeling a bit devastated right now. For the past few months, I’m playing garupa bandori (girls band party – bang dream) frequently. I’m casual, ofc, always casual, so I only play until I get the event card and only play again when the next event started. And… in this game, there are five (somewhat fictional) girls bands that consisted of Pooping’ Party, Roselia, Afterglow, Pastel Palette, and Hello Happy World. They are fictional. But for popipa and roselia (currently), there are the real bands too. The members are the voice actress for the characters. And yeah… I don’t think they are that skilled compared to the genuinely focused bands out there. But they are just more interesting for me. Because even though I don’t really know who they are as a person, I do know who they are as the characters. It helped to make a bridge from someone I don’t really care about to “hey, they are the one who voiced those interesting characters”. To cut the story short… one of the voice actresses for the characters in Roselia just announced her retirement yesterday (because of her health). To make the matter worse for me, I just recently watched their live concert blu-ray and got charmed by that very seiyuu. And she voiced my favorite characters in that band too! Fortunately, she doesn’t suddenly quit just like that. So she’ll still be around until May. Her fans just need to prepare their heart when the time for her departure comes. Well, I’m used to following idols (although my liking to them is a bit meaner than others: because they were interesting especially when being teased in the variety show lol), so I’m used to seeing them go (graduation and retirement aren’t same, I know). Honestly though… this is the first time I was rather devastated after seeing news like this. Maybe because my interest just got peaked and haven’t entered the chill phase, unlike the time I used to be a fan of an idol. It feels like I just planted the seed and feel moved when I saw the first bud sprouted then a few days later it got stomped and died. Yeah, well, it can’t be helped. I can only wish her all the best for the future. Goodbye in May. You will always be the “lisa-nee” for me. I wonder whether I will get used to the new Lisa later or get into that chill phase for Roselia or bandori in general. It is possible I would stop playing this game before or after May came. It is good until halfway of season. After that, it became cheesy mediocre your usual sport anime with cringe protagonist and his so-called rival. To be honest, I’m a bit skeptic about the characters. Koshiyama was your supposed beta herbivore Japanese guy. He was a nerd, smart, liked to read, and didn’t like the spotlight. Then fate (heh) chose him to be one of the players in the demonstration of his school quiz bowl circle. With his wide knowledge, he successfully answered the difficult question right and thus pulled the interest of our heroine, Fukami. You could guess the rest, it was as cliché as your favorite textbook. But it was fine. The pacing and storytelling were rather good so even cliché like this can pass without much criticism. The problem is later. The story told us that he didn’t like the spotlight, he didn’t even have friends and eat lunch alone in the library. But somehow, he overcame that problem without much trouble. Like… umm… sorry? If you wanted to make him feels like an ordinary guy, maybe not too popular, but not hated either… the least you could do was give him people who were not close enough to be a friend, but not far enough to be an only acquaintance. I mean, quiz bowl is pretty much a game that you can only win by getting in the spotlight. You have to chase away your nervousness (no overthinking and second-guessing yourself is okay) and quickly push the button. You have to be at least fine under pressure. And character Koshiyama at first didn’t seem to be fine at all. But this problem was shoved aside just like that. He somehow overcame that obstacle easily and it made his earlier personality feels like a joke. Don’t tell us he was a pathetic nerd who couldn’t even make a friend if you just then shoved it aside for the cringe plot you thought was more important than proper character development! You could always make him ordinary without making him that pitiful! Then, the plot development of the so-called rival was pushing the heroine role to the side. Fukami was the one that pulled Koshiyama’s interest in the quiz bowl. But when his rival appeared, her role gradually disappeared like the first part of the story didn’t matter anymore. Not surprisingly (cause this is shounen, and boys should be more skilled than girls #pfft), her skill wasn’t as good as the other monsters. Yeah, she was still good enough to be considered above average. However, compared to so many skilled people in this story, she became a rather mediocre player. Add that with leveled up Koshiyama, she was almost nothing except pretty face (maybe later in the manga they would make her better, who knows, but for now in the anime, she is not). The most annoying part is… I already tried to overlook the flaws of this anime from the very first episode and they somehow wanted me to overlook more!? The seiyuu for Fukami, THE HEROINE, was bad. It was not how I imagine her voice sounds like when I saw her image in the poster. Yeah, that was rather subjective. However, the way she talks was often a bit monotone too. I mostly blame the director though. How could you let this pass, what did you direct during the recording session! And they just became lazier because the few last episodes, seiyuu for Koshiyama slipped up too. So, yeah. The only good part is the few first episodes. For me, at least. I actually like this movie quite a bit. Unfortunately, the ending and the conclusion left too much bad taste for me to remember that nice feeling. They rushed the story from the middle part until the end and it doesn’t even make any sense. Yeah, they went to Ecuador, and yeah, as expected they got caught for real, then BAAM suddenly happily ever after. The heck? Are you kidding me? Not to mention, the character development for Finch just made him worse for me. He was okay before, I could sympathize with him even when what he did was only whining about his no good wife and their marriage problem. But after the character development, he became so stupid (reckless and careless) and annoying. And since Frank felt guilty about what he did in of his ignorance, he became too meek to control his partner’s idiotic behavior. I feel like they switched the roles. Frank, at first, was really annoying. He was an arrogant jerk, who couldn’t care less about others. But then, he grew. He realized his wrong-doing and became well, not so arrogant. Meanwhile Finch, at first, was your average nice guy. And they changed him. He became disagreeable after he realized his wife really didn’t love him. AND HE DID SOMETHING STUPID OVER AND OVER AGAIN AFTER THAT. Finally, they got home; somehow thanks to Finch (Frank was like secondary-not-really-important character in this part). But I won’t forget that he was the one who was being too careless in the first place and (one of) the reason they got trapped. And I’m not sure if what he did was brave or not. It was too reckless. They were lucky they could get out of there unharmed. …or maybe I should say it was a miracle. I wonder which news I should take as truth and which were not. Internet really doesn’t help. With how much useless information we have to read every day, it sometimes doesn’t even matter whether they are true or false. I love Honey and Clover. Well, maybe I should say “like”, since love is a strong word and my feeling doesn’t seem to compare to that. But I know I have high respect for Umino Chika, and more after I began to read 3-gatsu no Lion. Honey and Clover did a good job telling a slice of life kind of story. However I do think it suffered quite a bit by being too dramatic at the worst of time. I mean, love is a strong word, but it wasn’t actually that strong that it could control you without you let it first. And before I forget, I have to say I never read Honey and Clover. I just watched the anime. So I don’t really know Umino Chika’s style as mangaka until 3-gatsu no Lion. Different from H&C, 3-gatsu no Lion actually gave me not-so-good first impression. I don’t understand shogi, and I’m a very bad chess player, I never played a game with other people, but when I played against computer, I only win by luck or using undo option. Then the main character, Kiriyama Rei, came out to me as a weak looking ordinary boy, just genius enough he could be a pro shogi player when he was in middle school. It sounds contradicting? Yes, because it is. I ranted about Konoha (MC from Bungaku Shoujo) before in my goodreads review. And Kiriyama was a bit like him at first. He had more justification for being that than Konoha, though. However, after a while I began to warm up to him. His character development was really good. And after 10 volume passed I just realized I’ve had forgotten about him as that weak looking boy. He became stronger. And it didn’t seem forced at all. Then when he did something that betrayed our/their expectation, what could you do except smile wryly and let him do his way. (well, you could always sigh and show your disappointment about that). I like the premise of the story. That is, you can’t judge a book by its publisher. Because publisher doesn’t publish the book that you want, they just publish the books they think you want. And it’s not wrong. It’s a logical move. The only problem with this practice, there are always something unusual and unexpected you can’t guess. So, what the heck I am talking about? Of course, I’m talking about Zootopia. The premise of the story is good, simple but good. And the plot is interesting–enough. However, I have one problem with the culprit or… the antagonist. I mean, since the bad guys were from the same species, it feels a little bit like they just exchanged the roles of the Cinderella with her step sisters. Or little red riding hood with the wolf. Why it felt like they blamed it to only one person—or in this case, one species even though we know the fault in our stars—cough—pardon the lame joke. Even though we know the fault actually lies in our society. Yes, I know it doesn’t mean to be like that. As Judy said, there was mean bunny, as there was mean fox. But since the bad guys (the main antagonist and crew) were composed by only one species, you couldn’t help but think they are the bad one. Like we thought the wolves are bad because we read the little red riding hood story, or the cats are stupid after we watched Tom and Jerry. It wasn’t that simple, right? I know maybe they did it just because it was easier to understand if the bad guys portrayed by only one species, to avoid confusion, etc. And if we wanted to make some excuses, it was a family related kind business; you can’t trust strangers with such thing, yeah. But well, I still don’t like it. Since it gave too much hint to the otherwise potential twist. Well… there was still one nice twist. Thank goodness it wasn’t with the power of LOVE and PEACE. 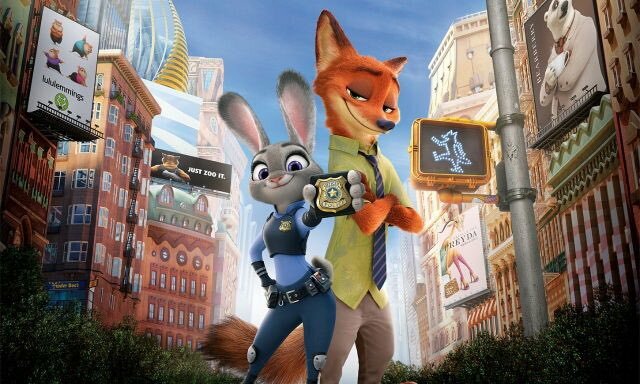 I know in Zootopia universe they were living together in harmony. But what the heck did the predators eat? Was there any meat? Meanwhile the bunnies still ate their carrots happily. (Answer: They were evolving to have a sweet tooth).